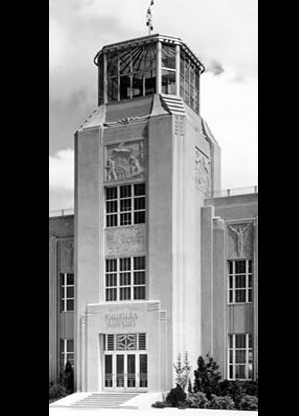 On February 10, 1934 more than 10,000 visitors from the United States, foreign countries and local New Orleanians attended the dedication of an airport that was to be "the Air Hub of the Americas". New Orleans Lakefront Airport was built adjacent to the Industrial Canal, on a man-made arrowhead peninsula jutting into Lake Pontchartrain. To make land available for this elaborate project, the Orleans Levee Board drove a 10,000 foot retaining wall into Lake Pontchartrain and pumped in six million cubic yards of hydraulic fill to raise the field above the water. Built at a cost of $4.5 million, the airport had a field measuring 3,000 feet long, thus qualifying for the U.S. Department of Commerce's highest rating, AA-I. 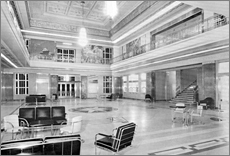 Not only was the field considered the standard for the times but the art deco airport itself was considered a wonder of architecture and decor. In the 1950's, New Orleans Lakefront was designated as a general aviation airport. However, as a part of the National Plan of Integrated Airport Systems, the Airport continued to expand to meet new demands. Runways and taxiways were added, lengthened, and straightened. The three new runways serve private, corporate, and military, and commercial air carrier aircraft. U.S. Customs and Agriculture is available 24 Hours a day. A new FAA Control Tower was built in 1988. The 6,895 foot main runway is routinely used by B-727's, B-737's, C-130's, and occasionally C-17's and C-5's. New Orleans Lakefront Airport remains one of the busiest airports in Louisiana. 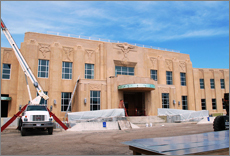 The Lakefront Airport was built in the 1930's. At the time of it's grand opening, it was considered an architectural masterpiece. 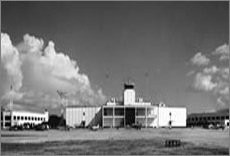 Built by the same architect that designed the Louisiana state capital building, it was the first major airport in the region, and served proudly as a general aviation airport to this day. 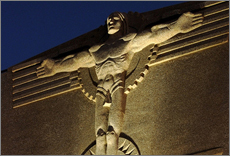 Inside the terminal building, travelers would find an Art Deco wonderland, featuring murals by artist Xavier Gonzalez, friezes by Enrique R. Alferez and an array of stone wall and floor treatments. Much of the terminal's architectural flash was lost to a heavy-handed renovation in the mid-1960s that encased the building's exterior in cement panels and enclosed a second-floor balcony overlooking the grand lobby, the latter step creating room for a warren of offices for the Orleans Levee Board. More recently, the building sustained wholesale damage of another kind when it took on four feet of water as Hurricane Katrina pushed Lake Pontchartrain waters inland.